Dhaka, 5 Feb, Abnews: A nomination paper, on behalf of Awami League’s presidential nominee, incumbent Md. Abdul Hamid was submitted to the election commission on Monday noon, reports UNB. 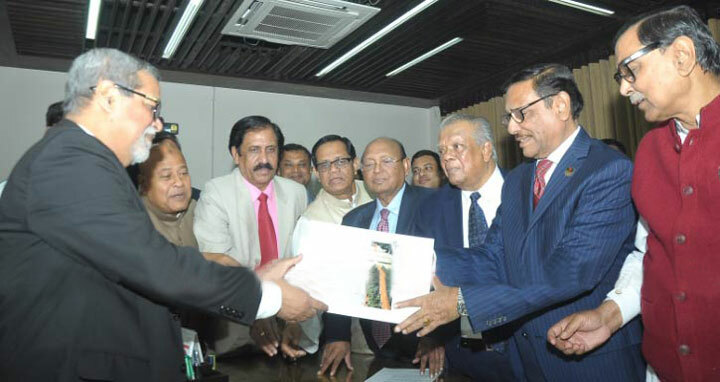 A nine-member delegation lead by Obaidul Quader submitted the nomination to Chief Election Commissioner KM Nurul Huda on behalf of incumbent President Abdul Hamidon Monday morning. Tofail Ahmed, Amir Hossain Amu and JS Whip Iqbalur Rahim were among the delegates. The deadline for submission of nomination paper for the presidential election is 4pm Monday. On Friday, AL team, led by chief whip AS Feroz, collected the nomination paper from the returning officer's office of the election commission at Nirbachan Bhaban in the city. Awami League on 31 January nominated Md. Abdul Hamid as its candidate to contest the presidential election.